New Cosmo Cricket is here! The Krazy, Amazing KETTO Stamps are NOW in stock! Hop on the bus to Scrapfest! 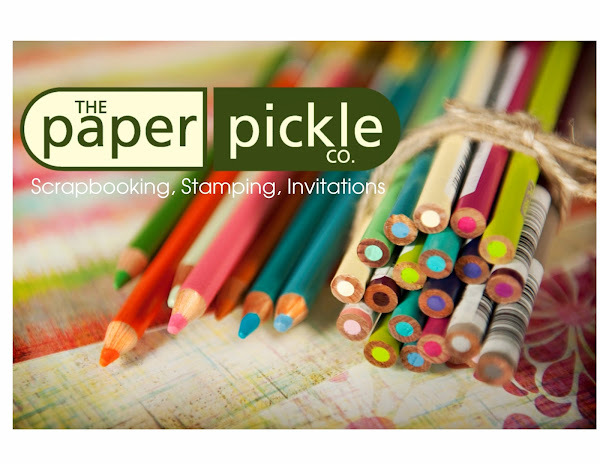 Looking for new, bright & cheery papers? They're here! Three of Cosmo Crickets newest releases JUST arrived this afternoon! You just have to see for yourself how fun they are... I can't even decide which of the two sides is my favourite pattern on most papers! The new familes are Snorkel, Girl Friday, and Lil' Man. We also recieved a few patterns from Chemistry. We have quite a few paper patterns to choose from, Rub-Ons from each collection, and also some stickers and chipboard stickers... come check it out! The next round of classes are here and I think you will agree they are some of our girl's best yet! Now I know I say this every time, but honestly, they are constantly amazing us with their beautiful designs. These cards speak for themselves! A must for any cardmaker interested in improving their skills of using coloured pencils and gamsol. You will also work with the Cuttlebug, nestabilities, embossing folders, glitter, creating backgrounds, working with decorative papers and ribbon. This is THE coolest mini album EVER! You just HAVE to take this class. The books measures about 4x4 when it is closed and you can see it explodes with fun when it opens! Beautiful. Adorable. And just way too much fun for one class! 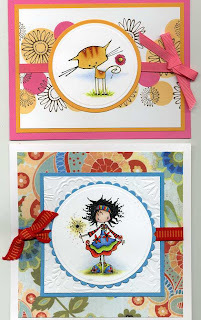 Pauline will show you how to add dimension and beautiful embellishments to make your cards look very "professional". The Cuttlebug along with nestabilities and embossing folders will be used. You will work with gamsol and coloured pencils. Accents include glitter, ribbon, prima flowers, ribbon and more. 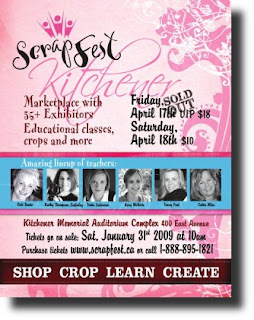 Seats are still available for the trip to Kitchener for Scrapfest 2009! Growing up in our house, each Birthday was such a HUGE deal! And, it should be... that is your very own special day! There are 7 people in our family, and all Birthdays fall between March and June, so it seemed like almost every other week we were having another birthday party! Now that our family has expanded so much (with 3 spouses and 4 kids), our birthday season runs a little longer... from March to August we celebrate 12 Birthdays! (the other 2 are right after Christmas). Talk about a run of Birthdays!!! No wonder why cake is one of my favourite foods! On the weekend we celebrated Julia's, my Mom and Kim's Birthdays. I was SO excited to have a chance to get out all my supplies and make some cards! After I gave the gifts, I quickly took the cards back, to take pic's, and they've now ended up in the store... that seems to happen alot! If you zoom in to the pic, you can see I sanded the edges of the core'dinations cardstock... I love this cardstock! We actually replaced most of our 12x12 cardstock to this! The inside colour is actually different, so if you sand it or tear it, it shows! The bird stamp is from Inkadinkado, and the Happy Birthday from Amuse. Isn't this stamp just too adorable?!? It is from Hero Arts. I stamped it once on white cardstock, and again on a light yellow g.c.d. paper. (You can see where I pieced the bird, leaf, heart and flower). What's better for a three year old's card , than a big 3-d sparkly cupcake and lots of PINK! This card took almost no time! I used Maya Roads raw chipboard (in the cute tins), and painted each piece. Each piece is separate, so you build your own cupcake, whatever size you want! After painting, I covered "celebrate" and the heart with glitter! The top of the cupcake I used liquid applique first and then covered it with glitter! The striped paper is g.c.d. AGAIN... Hmmm, I'm starting to notice a trend here... am I playing favourites! They're here!!!!!!!! Stamping Bellas new line called Ketto just arrived this afternoon. We were so excited we almost kissed the delivery guy! Have a look to see how many we got. I think we ordered nearly everyone! I can't wait to ink these girls! Also, we just wanted to let you know tickets are selling quicking for the bus trip to Scrapfest but there are still spots available! See below for details! Trust us...this will a day unlike any other! The Scrapfest bus is booked! This is going to be the best event we have ever planned and you honestly DON'T want to miss it! The cost of the trip will be $49. This includes bus ride, admission, and all taxes. There are only 26 seats so sign up early. Stop by The Pickle today to reserve your seat. Payment is required within 48 hours of booking in order to save a spot. 1. So you don't have to worry about driving early in the morning! 5. 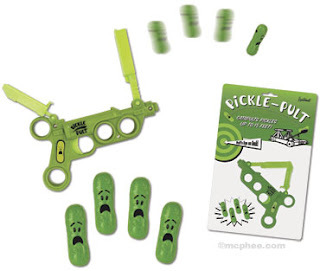 Where else can you play with a Pickle Pult? 7. You will be able to revisit your youth (those days of riding the bus to school) but only in style! There will be a tv, comfy seats and a bathroom! 8. You will be able to sit back and relax after a hard day of shopping....no worries about driving home! 10. Where else will you have this much fun?!?! Sign up today by calling 519.351.5220 or stop in at the store!! Kell has received her invite so I am now able to post Julia's invite! I am quite pleased with how it turned out. 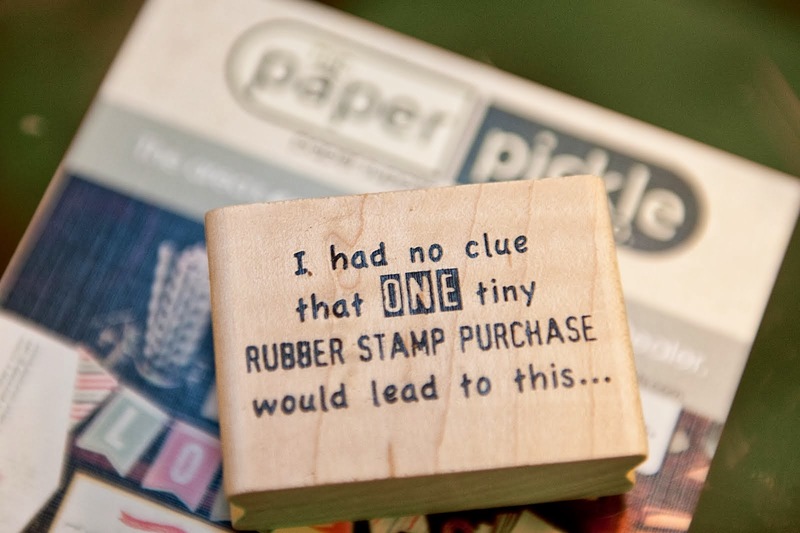 You honestly don't know how long I looked at "the wall" to find the right stamps! I was going to use one of Amy Smyth's triple cupcake stamp (since my girl will now be three...already!). Then I spotted it....Inkadinkado's new retro tree stamp. I just HAD to use it. Somehow Amy Smyth's bee stamp happened to come home with me and when I dumped out my supplies, the stamps collided and that was it! I just wanted to let you know about a great event that is coming up THIS Saturday. 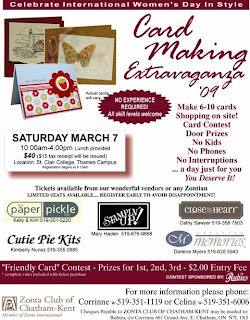 It is the Zonta Card Making Extravaganza taking place Saturday March 7th from 10AM-4PM. You will rotate through the various stations and make 6-10 cards over the course of the day. We will be there too! It is a great event....grab a friend and treat yourself to a day to stamping and come craft with us!! Please see the poster to the left for more information or call us at 519.351.5220. Tickets are available at the store!